BRACE YOURSELVES. PUMPKIN SPICE SEASON IS HERE!!!! Eating or drink anything with the blend of cinnamon, clove, all spice, nutmeg, and ginger always get me into the Autumn or Halloween spirit. 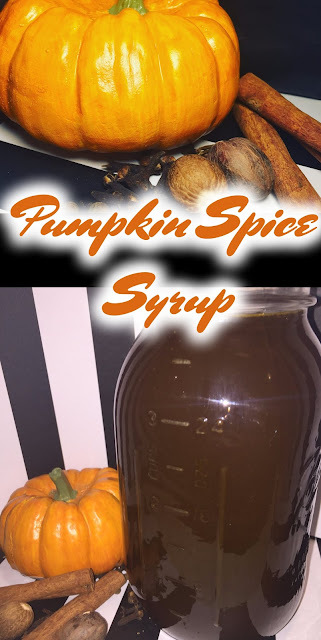 I was so ready for it I made my own Pumpkin Spice Extract, you should go check it out. Keep a look out for all the yummy Pumpkin Spice baked goods I'll be making the next two months. Did you know that Pumpkin Spice has been around since the 1890's? Who knew that our great-great grandparents were the inventors of our Pumpkin Spice obsession. Use this syrup in your coffee, hot chocolate, pancakes, waffles, biscuits, and scones. Anything that you would want syrup on it you can use this. Add to some half and half or almondmilk to make creamer. 1.) Dissolve pure pumpkin into water so it won't be clumpy. Turn the heat on medium high. 2.) Bump up the heat to high, add sugar, brown sugar and sea salt. Bring to a rolling boil for 5 minutes. 3.) Add pumpkin spice and vanilla extract, let boil for another 5 minutes. 4.) Turn off the heat and let it cool completely, about 1 hour. 5.) Once the syrup has cooled, transfer into desired container. You may need to strain it with a mesh strainer if the pumpkin didn't fully dissolve. Store in a cool area. Pumpkin recipes are to try now and this one is wonderful! Lovely share. I am a pumpkin lover. I would eat it all year long. This is perfect to celebrate the season, and can be used it many different recipes. Yum!! I have to admit.. I’ve never tried anything pumpkin flavored. There’s just something about “pumpkin” that grosses me out! But I’ve seen so many different recipes that look appetizing. I’m a fall lover as well so I know I should just give it a try! My parents love pumpkin and grow these themselves as well. This is definitely a recipe I'm sharing with them! Personally, I'm not a huge fan, but will certainly give it a go. I am not a fan of Pumpkin spice but I know many who are. So I will share this with my fellow DIY. Entering the best season of the year I love anything that involves Pumpkin. I have never try this yet so I am going to give it a go! it certainly is the rage right now! this is a great post - will save me some money from ordering my pumpkin spice lattes out every day! You've teased me with this recipe all over the internet... LOL I love it and can't wait to give it a try and a taste myself! This would be great on pancakes! I love pumpkin spice everything and can not wait to try this !!! As a food blogger I know I am supposed to embrace everything pumpkin spice but I dont! I may be the one blogger that literally does nothing pumpkin on my blog this time of year. BUT I eat lots though, and I would dive into that syrup. With pumpkin flooding the market, i was itching to try sommething new. I love the your recipe and plan to try it soon. Looks super cool -- its pumpkin season lol. Will definitely share to my friend who loooooves fall recipes like this! With the approach of Fall, pumpkin delicacies are a must. Although I've never tried to make at home, always starbucks ;) I might want to try this as this a syrup and can be used at multiple places. This may be exactly what I need to stop my daily coffee shop runs for an iced PSL! Thanks so much for sharing this recipe- I'm a sucker for anything pumpkin spice! I am not a pumpkin spice anything fan I am sorry. I have a friend who is super into it though she would love this. This sounds delicious and perfect for the first day of Fall! I'm obsessed with all things pumpkin spice! Looks amazing! So going to try making this this weekend! Making my own pumpkin spice never even occurred to me lol! So cool, thanks for forsharing! That's a great recipe. I love pumpkin soup and I like spicy food. I will def try this recipe. I dont like Pumpkin (I know I know!) but I know tons of people who would love this so I'll have to make it as little Thanksgiving dinner favors! I'd love to try this with coffee! A few months ago I tried orange syrup for the first time, and it tasted great with coffee, so I'm willing to try new fancy stuff! Also great idea to put it in pancakes, cannot wait! I do not know how I feel about pumpkin. I have always thought it had a interesting taste. Ooh I love the idea of adding pumpkin syrup to my pancakes, it would make my mornings so much more fall! This pumpkin spice syrup would be good to have on hand this fall. Helps making pumpkin anything easy and less time consuming. I love everything that has pumpkin as its ingredient. I have to try this recipe myself. A fabulous recipe! I just love this time of year when all these flavours seem to be de rigueur in just about everything. And like you, I love all those spices! This sounds amazing! I am not a huge fan of pumpkin though. Do you think your recipe would work with sweet potatoes too? I'm pretty sure you could use sweet potatoes. This looks really useful for all kinds of recipes! How thick is it? I'm sure it would be useful in all sorts of recipes! It has the same consistence as regular syrup. This pumpkin spice syrup looks so tasty and interesting. I will definitely try to do this one. Tis the season for literally everything pumpkin. Enjoyed reading your post!!!!!! Looks tasty! Pumpkin spice syrup sounds delicious, especially for this time of year with the fall approaching. I have never had this syrup. I'm looking forward to giving it a try! Thank you!